Even experienced cooks can be intimidated by making bread at home and, granted, some breads are really difficult to DIY. All that kneading! Who has the arm strength for that? (Answer: Not us.) Well, enter this recipe for no-knead bread. 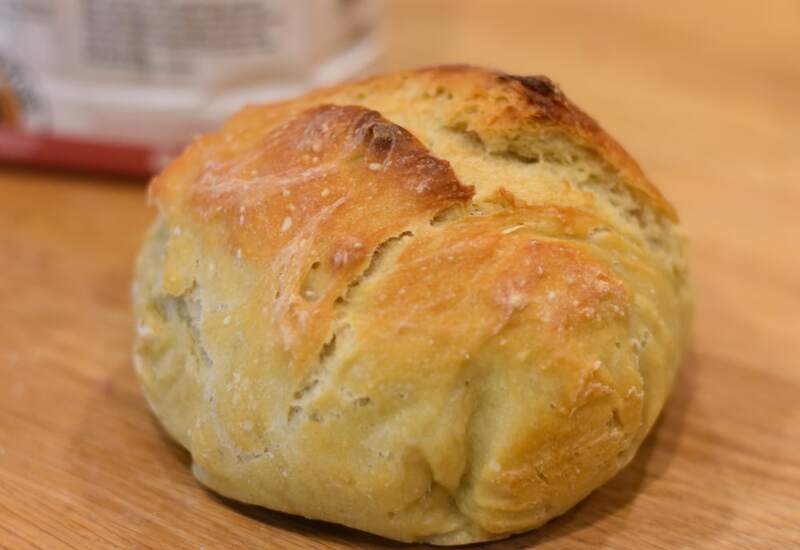 All you need are four simple ingredients (flour, water, yeast, salt), a little time, and a hot oven. At the end, you'll be rewarded with a perfectly crusty and delicious loaf of bread. Not to mention, your house will smell amazing. Get the butter ready—this baby will be devoured right out of the oven! With bread baking (and with most things in life, really), patience is a virtue. The longer you let the dough rise, the more tangy your bread will be. You can refrigerate the dough for up to 5 days to get a good tang and more of a sourdough loaf. Per Serving: 930 calories; 3g fat; 193.3g carbohydrates; 28g protein; 0mg cholesterol; 2132mg sodium.